Every day I see the news traffic concerning long-term care Medicaid issues. Today I noticed an article about a Wisconsin attorney who was disbarred because she apparently was doing estate planning but didn’t understand Medicaid planning. For years I have said that if you are a lawyer or financial advisor providing services to seniors and you don’t understand Medicaid planning, you’re at risk for malpractice. Apparently, you’re even at risk of losing your licenses altogether. After a botched estate plan that included transferring assets to a so-called “Transition Trust,” Laux carried forward with a Medicaid eligibility plan that chose Spousal Refusal over Spousal Impoverishment protections. Even the court weighed in that pursuing Spousal Impoverishment protections “would have been the preferable option given the size of the clients’ estate.” Doing so caused a long delay in the client’s Medicaid eligibility and exposure of an additional $50,000 in care costs that the couple would not have otherwise had to cover. If I were Donald Trump, I’d probably call her an “idiot.” Ethical breaches aside, when you put her planning techniques under the microscope she clearly didn’t know what she was doing. A lot of advisors that work in the senior marketplace don’t even understand the difference between Medicare and Medicaid, let alone the difference between long-term care Medicaid and Medicaid health insurance. Many confuse the Medicaid gifting rules with the IRS gifting rules. They just stick their head in the sand like the proverbial ostrich and figure that what they don’t know won’t hurt them. Are you that kind of advisor? If so, there’s help for you yet! LEARN MEDICAID PLANNING. I’m all about making it easy to go from head in the sand to head-and-shoulders above the rest. I teach the most comprehensive course for Medicaid planning which is available online. And if you’re looking for a good summer read, try my textbook on Medicaid Planning – the largest textbook ever written on the subject. It’s not as much a “page-turner” as it is an “eye-opener.” It’s also chock full of practice tips that can really help improve the way you do business. GET CERTIFIED. 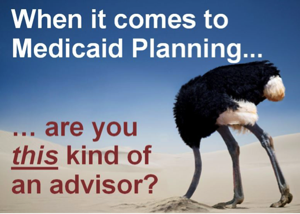 As Chairman of the Certified Medicaid Planner™ Governing Board, I would encourage everyone who reads this and wants to be considered legitimate as a Medicaid Planner to get certified. The CMP™ designation is the only one of its kind in the industry. It has full NCCA accreditation and increasingly becoming the gold standard for Medicaid Planning in the US. GET ASSISTANCE. As a Cav’s season ticket holder, I can tell you this: As good as LeBron is, he still needs 4 other guys on the court at all times providing him assistance in order to win a game. You don’t have to feel like you need to do it all on your own. Our mentoring and case support services can help you with your Medicaid planning cases in a cost-effective way. JUST DON’T DO IT. If you’re in the senior market as an estate planning attorney or financial advisor and you don’t want to do anything I’ve recommended here, then just get out. Go find some other way to make a living that doesn’t jeopardize your clients and their financial security. And that’ll be the best first step to avoiding jeopardizing your own licenses and your own ability to make a living. And you can easily avoid me writing another article like this making you the poster child for advisors who were too dense to get it right. Whatever you decide to do, don’t be a “Laux” advisor.